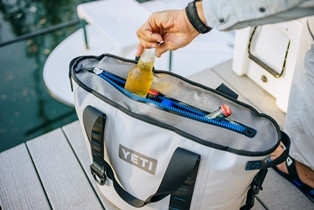 This summer, YETI will display its new portable soft cooler at the International Convention of Allied Sportfishing Trades (ICAST), and the Outdoor Retailer Summer Market. “The Hopper” will be available for purchase October, 2014. AUSTIN, Texas (July 9, 2014) — YETI Coolers, the brand that launched the premium cooler category in 2008, will extend its commitment to creating durable, high quality products with the introduction of the portable Hopper cooler. YETI will debut the Hopper at the International Convention of Allied Sportfishing Trades in Orlando, Fla. on July 16. The Hopper has 5.2 gallons of capacity and is constructed of 840 denier DryHide™ fabric, similar to the material used in whitewater rafts. The HydroLok™ Zipper is the ultimate in waterproof, airtight zipper technology, borrowed from survival suits and HazMat protective gear. ColdCell™ Insulation provides a deep and lasting chill thanks to one inch of insulation in the sides and 1.5 inches on the bottom of the Hopper. The heavy-duty EVA foam bottom and RF-welded seams provide waterproof construction and unmatched durability. The YETI Hopper will be available at select retailers and online at www.yeticoolers.com on Oct. 1, 2014. YETI will display the Hopper during the International Convention of Allied Sportfishing Trades (ICAST), July 16-18 in Orlando, Florida, and the Outdoor Retailer Summer Market, August 6-9 in Salt Lake City. Wildly Stronger! Keep Ice Longer! Whether you’re a hunter, fisherman, outdoorsmen, camper, or tailgater, demand more from your cooler. For more on the company and its full line of products and accessories, visit www.yeticoolers.com. And, don’t miss the video of a Grizzly attacking a YETI Cooler!